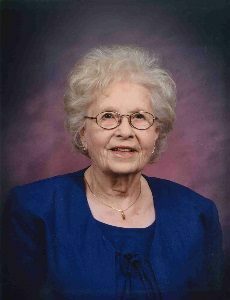 Helen “Omsie” Hansen, age 107, of Hutchinson, Minnesota, passed away Sunday, November 25, 2018, at Harmony River Living Center in Hutchinson. Funeral Service will be held on Wednesday, November 28, 2018, at 11:00 A.M. at Faith Lutheran Church in Hutchinson with interment in the Oakland Cemetery in Hutchinson. Helen “Omsie” (Griebie) Hansen was born on September 13, 1911, in St. Paul, Minnesota. She was the daughter of George and Pauline (Drews) Griebie. Helen was baptized as an infant on October 17, 1915, by Pastor Bode in Brownton, Minnesota. She was confirmed in her faith as a youth on January 3, 1926, at Immanuel Lutheran Church in Brownton by Pastor Weerts. She attended School District 81 and Brownton High School. On June 27, 1936, Helen was united in marriage to Raymond Hansen at Immanuel Lutheran Church by Pastor Henry Weerts. This marriage was blessed with two children, Ron and Glenna. Helen and Raymond lived on a farm in rural Stewart, Minnesota, where she was active in the farm operations. They shared 32 years of marriage until Raymond passed away in 1968. Helen moved from the family farm to Hutchinson in 1972, and later to The Pines in Hutchinson. In September, when she needed assistance with her daily care, Helen moved to Harmony River Living Center in Hutchinson. In addition to being a homemaker and a loving mother, Helen was a caregiver for the elderly and young children for many years. Helen was a member of Faith Lutheran Church in Hutchinson. Helen enjoyed ballroom dancing, gardening and flowers. She especially enjoyed spending time with her children, grandchildren and great-grandchildren. Helen passed away on Sunday, November 25, 2018, at Harmony River Living Center in Hutchinson, Minnesota, at the age of 107. Many Great-Grandchildren, Great-Great-Grandchildren, and other relatives. Helen is preceded in death by her Husband, Raymond Hansen; Parents, George and Pauline Griebie; Grandson, Cory Hansen. Omsie was a very Beautiful funny happy lady when I helped her at The Pines. She was my “special grandma” there. I will never forget “Omsie.” Caydence just told me you had her 107th birthday party! Doug and I are so sorry to hear of Omsie’s passing. She was a very sweet Lady. You all have our Deepest Sympathy. I so enjoyed caring for Helen for years. I used to ask her what her secret to vitality was and she would say “Always sleep past 10 am, and you’ll live a long life”. Great advice Helen! I will miss you! My thoughts and prayers are with you. Loved talking to Helen anytime she came into HPP. Sweet lady! !